The business brought on board a new group of consultants - all between 5 to 12 year old - to make sure their planned communities will be as kid-friendly as possible. The "A" Crew will be charged with providing feedback on what children like, and Avanti will use the group's advice to develop activities that will help keep grandchildren visiting regularly. "We're different than a lot of senior communities," said Lori Alford, co-founder and chief operating officer for Avanti Senior Living. She started Avanti Senior Living in 2013 with CEO Tim Hekker, who combined have more than 50 years of experience in the field. "We saw lots of areas in the industry that we thought could improve," Alford said of the company which will open its first facility in Cypress, Avanti at Towne Lake, in July. "It's nice to build something from scratch." The facility will provide 50 assisted-living suites and 40 suites for those with dementia or Alzheimer's. Alford said the company will initially build senior living communities in Texas, Florida and Louisiana. Then, it plans to move into other markets nationwide. Another local center, Avanti at Vision Park, is planned for Shenandoah. One focus is on making the centers a place where kids would want to come. "The goal is to get kids to say, 'We don't want to leave' not 'When can we leave?' " Washburn said. Alford's 9-year-old daughter, Bailee, came up with the idea of "A" Crew. She now serves as chairwoman of the board. Alford's 8-year old son, Brayden, is also a member of the organization. "My kids come to work with me," Alford said. "They see children visiting their grandparents. A lot of time the kids seem scared." Bailee proposed getting a group together to come up with things that children could do when they visit. "We want to make something so when kids come, they're not bored," Bailee said. She said that they might want to play board games or go out on the playground. Children may also want to play with their grandparents on the residents' message tablets or read children's books, which could be kept in the center's library. "We got together in a big group and shared our ideas of what we want to eat and what we want to be called," Brayden said. The team members are all Houston residents, enrolled in first through fifth grades. "Some of them are our neighbors, some of them go to our schools and some of them are our friends," Bailee said. The Avanti team members spent an entire day with children to find out what kids like, what they enjoy doing and what would make visits with their grandparents a blast. The "A" Crew came up with a logo, ideas for snacks and meal options and a range of ideas for events and activities. "They could have frozen yogurt on the kid's menu," Bailee suggested. The participating children suggested fun activities like Harry Potter parties and "how-to" classes in the art studio. Each Avanti community will feature resort-style activities and entertainment options, including an art studio, an exercise room with a ballet bar and a full-service salon and spa, including a nail bar and hair services. "We're reimagining senior living," Alford said. "We want to take away that stigma. We're more like a boutique hotel. We want people to say, 'Wow, I'm going to live here.' "
Tyler Washburn, with the architecture firm PRDG, serves as project designer. He said the exterior of Avanti at Towne Lake exemplifies a modern take on the Texas Hill Country style. "The look of the exterior is very different from what's typical of senior housing," he said. Design features inside include vaulted ceilings and windows overlooking outdoor courtyards. "It's more of a place where you choose to live and not a place where you end up," Washburn said. 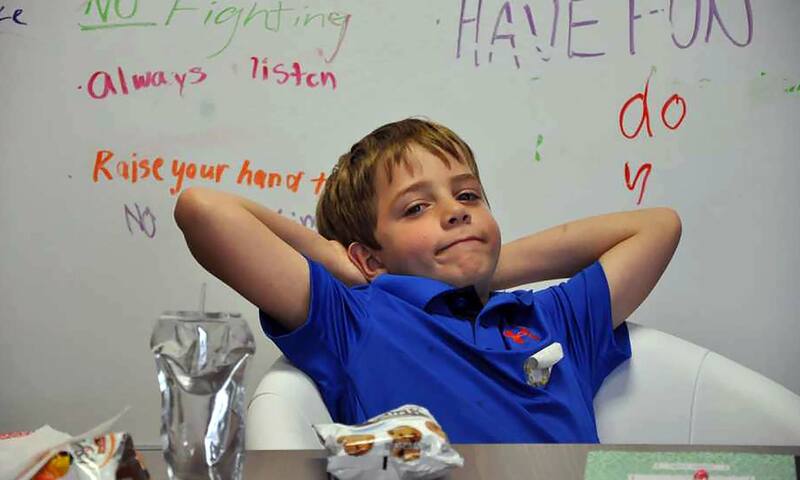 Avanti at Towne Lake planners are considering the idea of having a monthly "kids council" meeting after a special event or activity to get feedback on what the children like so far and what they would like to see. Residents will also be prompted at resident council meetings to discuss their grandkids' food and activity preferences. This interaction will constantly challenge the Avanti team to come up with fresh ideas to connect the residents with their grandchildren. "I know the importance of having the younger generation around the older generation," Alford said. "The younger generation learns so much from their grandparents, and the older generation gets inspired and is entertained by the grandchildren. It's important to connect the two."